Lululemon plans to reach $US1 billion in international sales by 2020. Analysts at Oppenheimer believe that company is well on its way to getting there thanks to its strong fundamentals. Although former CEO and chairman Laurent Potdevin abruptly resigned over allegations of fostering a “toxic” work culture in February, the analysts believe that the company’s fundamentals are still strong. 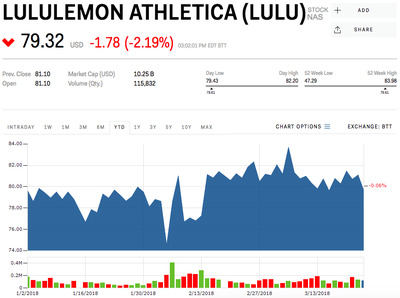 You can view Lululemon’s stock price in real time here. Lululemon has set its sights on reaching $US1 billion in international sales by 2020, and its well on its way to getting there, analysts at Oppenheimer say. According to its third-quarter results, the athleisure retailer’s sales in Asia doubled in the third quarter, while in Europe they were up 40%. The company reported total quarterly sales of $US619 million, up 14% from the same quarter last year, and sales for the first three quarters ended October 29 was $US1.72 billion. That “long international runway,” could help reach the $US1 billion target, Oppenheimer analysts Anna Andreeva and Samantha Lanman wrote in a note to clients. Online penetration in China alone is expected to grow 40% to 50% by 2020, the analysts said. This should offset slower sales growth in Europe. The company’s ambitious 2020 sales target is part of a larger plan to grow the company’s total sales to $US4 billion. Lululemon expects $US1 billion of that figure to come from international sales, $US1 billion from online sales, and another $US1 billion in sales of men’s apparel, its former CEO and chairman Laurent Potdevin said in an investor call in December. Although Potdevin abruptly resigned over allegations of fostering a “toxic” work culture, the analysts believe that the company’s fundamentals are still strong. They raised their price to $US88 per share, from $US75, and gave the company an “Outperform” rating. Lululemon’s stock was trading at $US79.50 per share on Friday, unchanged for the year. The company is expected to report fourth-quarter 2017 earnings results on March 27. You can view Market Insider’s earnings calender here. Read more about why Lululemon’s management woes will end up hurting it in the long run.